Visitor entrance is via the Main gate. 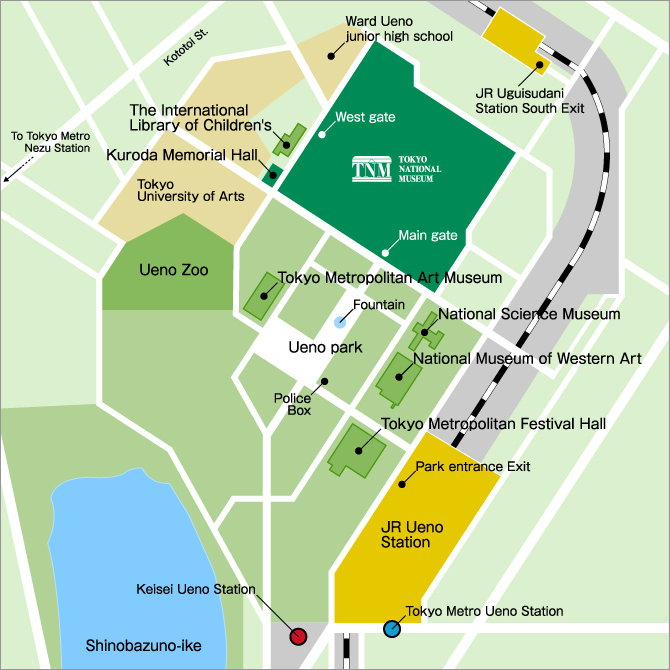 - 5 mins from Ueno Exit, off the Shuto Expressway Ueno Route. Please note: there is no parking at the museum. * ( ) indicate prices for those in groups of 20 or more. * Special exhibitions require a separate admission fee. * Persons with disability and one person accompanying them are admitted free of charge. * Regular admission is free for persons under 18 and over 70. Please show proof of age (driver's license, passport, etc.) when entering. * Free admission to regular exhibitions on International Museum Day (May 18, for 2019), Respect for the Aged Day (the third Monday of September: September 16 for 2019). 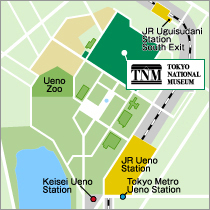 * Besides at the museum ticket counters, individual tickets, including student discount tickets, for regular exhibitions can also be purchased in Ueno station at Museum Tickets, an external ticket office located in ecute (within the ticket gates). At the Main Gate Plaza, visitors can rent audio guides (available in Japanese, English, Chinese, and Korean) for the regular exhibitions. Japanese and English devices are installed with the Museum’s official smartphone app, “Tohaku Navi,” while Chinese and Korean devices contain unique audio contents. Note: The artworks featured for each language are the same. The number of devices is limited. Admission to Regular Exhibitions is free on International Museum Day (May 18) and Respect for the Aged Day (September 16). Admission free. Kuroda Memorial Hall is located at the corner westward from the Main Gate of the museum. Admission free. Please enter from the West gate. Open until 21:00 on Fridays and Saturdays. Regular exhibitions will be open until 21:00 on November 3 and 4, 2019. Open until 22:00 on September 20 and 21, 2019. Research and Information Center: Closed on Saturdays, Sundays, national holidays, the last day of the month (if this falls on a holiday, the day before), and during the year-end and New Year holidays (please ask for specific dates). Also closed as occasion demands. Open on Monday, March 25, August 13, October 15, 2019 and March 30, 2020. Closed on Tuseday, June 11, for annual facility maintenance. Closed on Wednesday, December 26, 2019 - tuseday, January 1, 2020. Hyokeikan will be closed unless special exhibitions and events are held inside. Rooms 11–18 on the 1st floor of Honkan (Japanese Gallery) will be closed for maintenance work on Monday, December 9, 2019 - Wednesday, January 1, 2020.